This numerical tour present some advanced method for denoising that makes use of some exoting 1D thresholding functions, that in some cases give better results than soft or hard thresholding. Here we use an additive Gaussian noise. First we load an image. Then we add some Gaussian noise to it. Compute a 2D orthogonal wavelet transform. Hard and soft thresholding are two specific non-linear diagonal estimator, but one can optimize the non-linearity to capture the distribution of wavelet coefficient of a class of images. 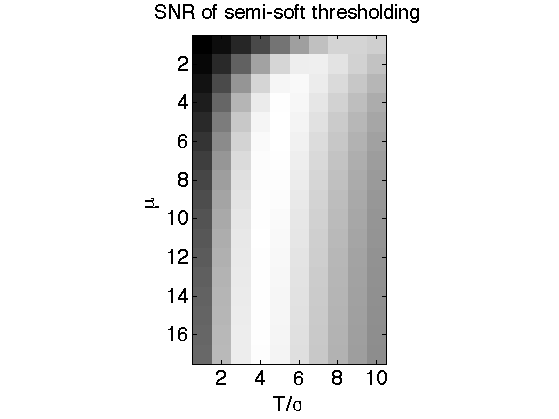 Semi-soft thresholding is a familly of non-linearities that interpolates between soft and hard thresholding. 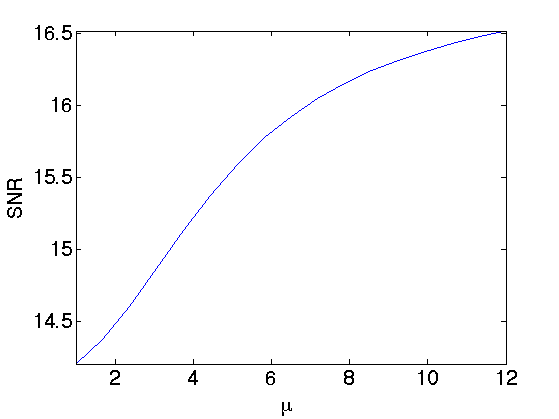 It uses both a main threshold T and a secondary threshold T1=mu*T. When mu=1, the semi-soft thresholding performs a hard thresholding, whereas when mu=infty, it performs a soft thresholding. Exercice 1: (check the solution) Compute the denoising SNR for different values of mu and different value of T. Important: to get good results, you should not threshold the low frequency residual. One can display, for each mu, the optimal SNR (obtained by testing many different T). For mu=1, one has the hard thresholding, which gives the worse SNR. 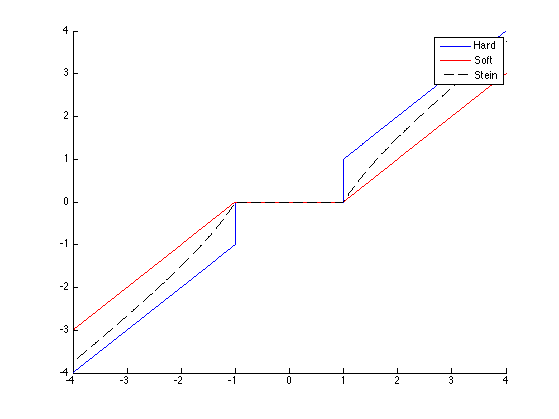 The optimal SNR is atained here for mu approximately equal to 6. 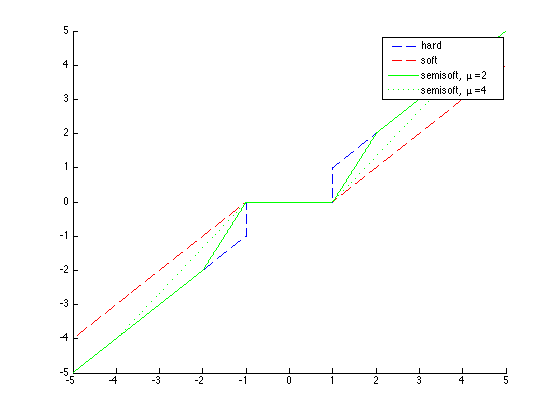 Another way to achieve a tradeoff between hard and soft thresholding is to use a soft-squared thresholding non-linearity, also named a Stein estimator. We compute the thresholding curves. We display the classical soft/hard thresholders. 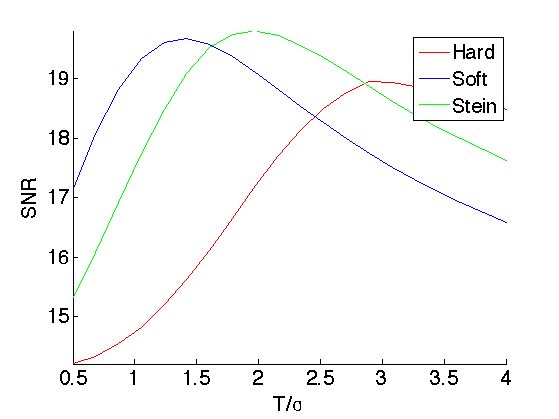 Exercice 2: (check the solution) Compare the performance of Soft and Stein thresholders, by determining the best threshold value.